The Big Stick by Colt Cams the originator of the new Cold Chill Billet Steel High Performance Diesel Camshafts for the Cummins 5.9L and 6.7L diesel engines. The Big Stick offers a 181/210 profile which provides superior proven performance for your Cummins engine. KLM Performance sells the Dodge Cummins Big Stick High Performance Cummins Diesel Camshaft as a package. This Colt Cams the Big Stick High Performance Cummins Diesel Camshaft is NOT A REGRIND! KLM Performance Inc. and Colt Cams are extremely proud to announce the new High Performance Diesel Camshafts for the Cummins 5.9L and 6.7L diesel engines. The Colt Cams the Big Stick High Performance Cummins Diesel Camshaft is the best in the business. 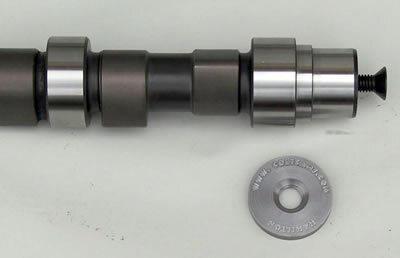 KLM searched the world for a manufacturer that could produce only the highest quality Diesel Camshafts from a propriety cold-chill cast cam blank for use on the Cummins diesel. KLM teamed with Geoff Bardal of Colt Cams to become one of only three approved distributors for the Colt Cams in the U.S.
Colt Cams was able to develop and manufacture a super high quality billet camshaft for the Cummins 5.9L and 6.7L diesel engines. The Colt Cams proprietary Cold-Chill Diesel Camshafts are designed for safe operation at up to 4,000 RPMs. These replacement camshafts with unique cam profiles offer huge performance gains. All of the Colt Cams high performance diesel cams are OEM spec and made from cold-chilled cast billet units that are ground in three stages to the final specs. All Colt Cams diesel camshafts are rough cut, checked and re-straightened if necessary, then medium cut to within 3 thousandths of an inch, checked again and then given a final cut to within 1 thousandths of an inch before final prep and Parkerizing. Parkerizing is the last step that some big name camshaft companies will not even offer. It is another crucial step Colt Cams uses to help break in these high-performance camshafts. Parkerizing is a process where a heated acid bath microscopically etches the metal surface and adds a very thin layer of graphite coating. This graphite layer allows the cam lube to hang onto and penetrate into the cam surface during cam break-in. Attention to detail is what Colt Cams is all about in creating these high-performance diesel camshafts. Colt high performance Cummins Diesel Camshafts are machine-radius-cut on each and every cam journal lobe. The Radius Cut of the Colt high performance camshaft is something NO other cam manufacturer will do, as this is a very painstaking, time-consuming task. Colt Cams feels the radius cut is critical in making sure that the sharp edges of a ground cam are properly beveled to ensure that pieces of the tapered cam do not fall off into your valve train, risking damage to your motor. Ask any other cam company if their high-performance diesel cams are radius cut. Colt Cams the Big Stick High Performance Cummins Diesel Camshaft is proudly MADE IN CANADA! 1989 to 2012 Dodge Ram 5.9L and 6.7L Cummins diesel engines.